With Rocrail trains can be operated manually, in half automatic or in (full) automatic mode. For different trains these modes can be mixed on the same layout at the same time. 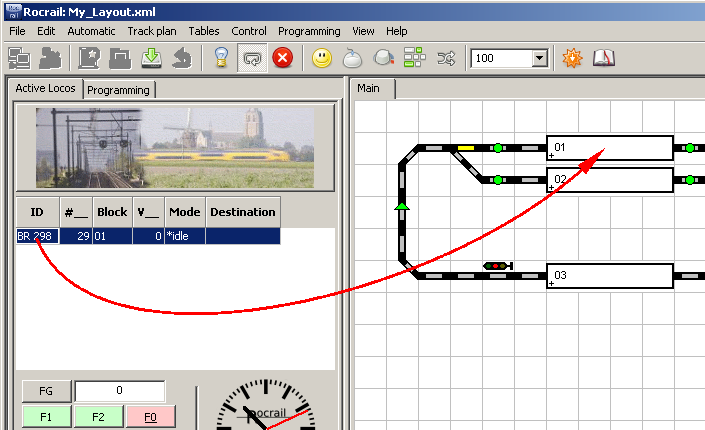 In manual operation the user has to decide which track system the train should take and settings of routes, switches and signals have to be made accordingly regarding possible obstacles. Thus the user is working as a train dispatcher (rail traffic operator, train controller) and a railroad engineer (locomotive engineer, train operator, train driver) at the same time. Rocrail does not interfere in manual train movements and it does not keep track of those movements. 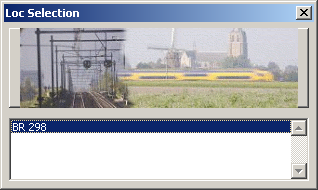 It thus can not decide where (i. e. in which block) a train is. In half automatic mode Rocrail is seeking a free block, is setting the route to this block and the switches and signals for this route. The user still has the job of the railroad engineer: Driving with the speed allowed and stopping in time lies in the user's hand and responsibility. In automatic mode Rocrail takes care of all tasks: It will look for free blocks, set the routes switches and signals and will accelerate the train, control the speed, decelerate where necessary and stop the train safely. Tip: If one or more of these conditions are not yet met chapter 7.0 of the tutorial will be helpful. To start running in automatic mode at first track power has to be switched on, then automatic mode is activated by either pressing the symbol in the symbol bar or using the menu Automatic → Auto mode. right clicking on the block symbol (which is to be block 01 in the example) and selecting Select locomotive assignment…. In the following dialogue the loco ID is double clicked. or by dragging the loco ID from the loco panel and dropping it on the block symbol. The sample loco is standing in block 01, represented by block colour red and the loco ID shown inside the block symbol. If the direction arrow in the block does not point to the direction desired the loco ID on the loco panel has to be right clicked and Swap block enter side has to be selected from the menu. Excursus: Running direction means the direction of movement in the block as described for block side routes. If a loco was placed tender ahead the placing (see also picture above) had to be swapped, too in order the loco to receive reverse commands to exit the block to the right. Taken together, direction or running direction refers to the direction of movement in a block or on a route while placing refers to the physical orientation of a loco. Direction and placing is a rather complex issue. For the moment it is sufficient to ensure the loco's physical orientation (placing) is correct, the loco is indeed running forwards receiving forwards commands and the arrow in the block is pointing to the wanted direction. In this mode the loco or train is given a destination block prior to starting it. The destination block can either be the next block or a distant block. However, it has to be ensured the block can be accessed using one ore more routes. Rocrail does not necessarily take the shortest way possible if multiple routes are involved. To assure the train will arrive at its destination there must be no branch lines at all on the way or the blocks of these branch lines have to be closed before starting. A random new destination is searched for if the wanted destination is already occupied or the route to it can not be used. Use Schedules to force all destinations. Permissions and conditions will not be taken into consideration for the destination block and the route to the destination block! Hence, with a given destination it is possible that a loco or a train may run into a block although the loco- or train-type is not allowed in this block. Tip: Using the configurable Finder - depending on its settings - the shortest path to the destination is calculated and a schedule is created automatically ensuring the train will reach its destination without detours. To run a loco in automatic mode it is simply dragged to the destination block which will cause it to start immediately. Tip: With Linux and OSX (but not Windows) a loco can be placed on a different level using D&D, too: First the loco is dragged on the tab of the level until the level opens up, then the loco is dropped/placed in the desired block. Look at Drag&Drop for more information about "Add to Trip". Running without destination a loco is driving to the next free block available, subsequently another free block is searched for. The choice of destination blocks, in basic settings, depends on block occupations only (an occupied block is not a valid destination). 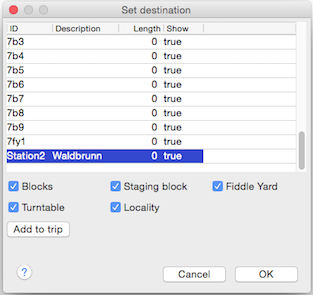 If multiple free blocks can be accessed the destination is set by random choice. 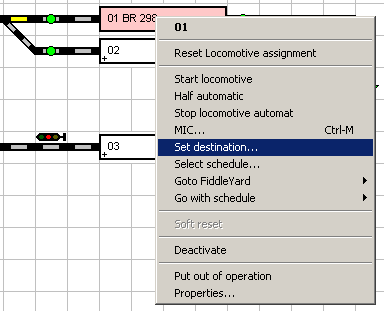 To run a loco without destination either Start locomotive is selected from the context menu of the block (see figure in the above section) or Start all locs is selected from the Automatic menu or a double click is performed on the block symbol. Running in automatic mode is stopped by either selecting Stop all locs from the Automatic menu or by pressing the corresponding button in the symbol bar. 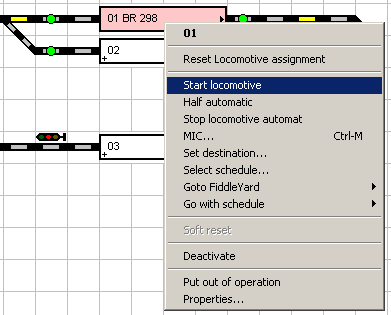 Single locos, additionally, can be stopped by selecting Stop locomotive automat from the context menu of a block the loco occupies or has reserved (block colours red, blue or yellow). The automatic choice of destination blocks can be manipulated by means of further settings in Rocrail. E. g. certain trains will - if possible - use dedicated routes only or some routes are locked for certain types of trains or platforms in stations are used by dedicated trains only. These settings are described in detail on page Block Types and Train Types. The setup is the same as in Automatic Mode. The only difference is that the train is started from the context menu of the starting block using the menu item "Half automatic". Rocrail then chooses a free destination block, if available. Now the Train its velocity can be and has to be controlled manually. The user is in charge to stop trains in time and to regard speed limits! Rocrail will set the velocity of a train running in half automatic mode to 0 (zero) at the IN event if the train has to stop in the block (Revision 3838+). Caution : If previous speed limits were not regarded the train is likely to stop to late, i.e. not within the block limits. Risk of accidents! If the loco is set to Manual Operated it will stay in Half Automatic Mode for all further actions. idle Train is not in automatic mode. If a block has the "Accept Ghost" option set, an incoming unknown train will be accepted and get the name "Ghost". This will provide a way to run in a new train without the track power being switched off automatically. Afterwards the Ghost train can be set to it's real name and is then part of the system. If the block does not accept ghost trains the track power will be switched off immediately to prevent accidents provided this function is enabled in the Rocrail properties.